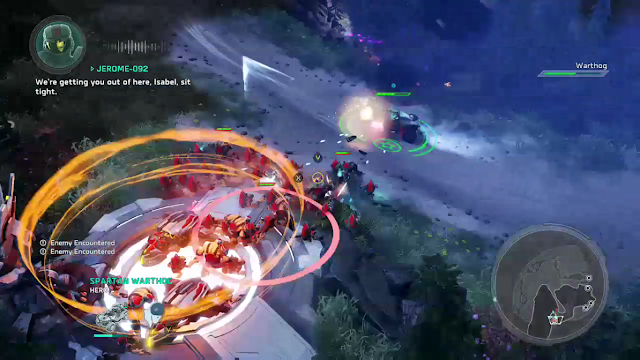 Halo Wars was an experiment in expanding upon a universe entirely viewed in first person. Though Bungie originally wanted Halo to be a real time strategy, some could argue that Microsoft caught lightning in a bottle when the company convinced Bungie to shift the focus over and make a FPS instead. As good as those games have been, Halo Wars proved that Bungie was also on to something with that RTS idea, and though Bungie is no longer in the picture, Halo Wars 2 attempts to build upon that foundation. It has been some time since I have played anything from the RTS genre, I had spent countless hours playing Warcraft, StarCraft and Command and Conquer during my high school years, yet as time went on and those series expanded (and plenty more entered the scene), my interest waned. Because of this, approaching Halo Wars 2 was always going to be an interesting return to RTS for myself, particularly because I was so used to using PC controls, I was especially intrigued to see how the game would handle with the Xbox One controller. After tackling the tutorial levels, my intrigue quickly turned to joy. Creative Assembly and 343 Industries has done a remarkable job of incorporating a decent control scheme that is both accessible and deep. My complete beginner’s approach was able to blitz through much of the game without the need to dig into deeper territory, though for more experienced strategists, there are plenty of controller shortcuts that have been built in to assist quick response times. But what is a good control scheme without a solid narrative to keep the player interested? Halo Wars 2 offers a campaign that services the Halo canon well, but also breaks no real ground. The crew aboard the Spirit of Fire awake after a long cryosleep to discover a signal beacon. The crew awaken and the Human-Covenant war has ended. Captain James Cutter decides to explore the signal coming from the Ark, soon discovering that the humans have long since been destroyed. After finding Isabel, an AI, they are confronted by Atriox, who easily takes out one of the Spartan soldiers as if they were nothing. The crew escapes back to the Spirit of Fire and make a hasty retreat. Isabel then explains the situation: Atriox rose from Covenant rule, inspiring other Brutes like him to wage war against Covenants and Humans alike, becoming one of the most feared forces in the galaxy. Captain Cutter tells an inspiring military speech about not giving up, and so goes the narrative. The performance delivered for Isabel makes the game alone, her portrayal feels authentic and real, and lifts the rest of the cast on her own. All of this is told through impressive pre-rendered cut scenes, and also through the gameplay. I have been so used to just playing war games in the past, that actually playing a narrative in an RTS felt like a foreign concept to me. 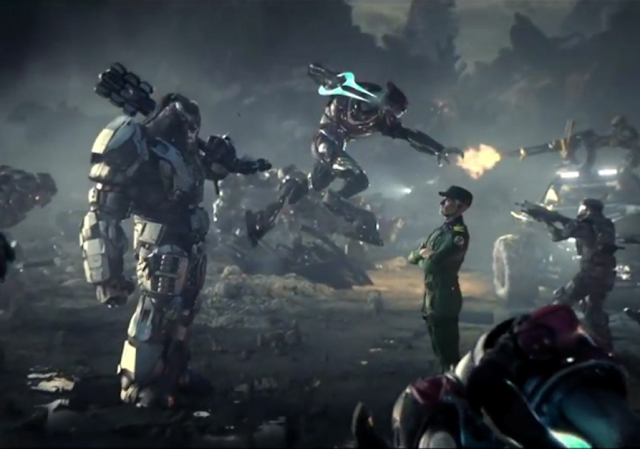 It made Halo Wars much more intimate as a result, particularly in the mission that takes place in the narrative explained above, where only a single Warthog is playable. The lone Warthog and its three crew members explore the lonely landscape around them, and when everything goes wrong, it is only the Warthog being controlled during the escape. It makes for much better storytelling than the usual “build a base, build 100 tanks and kill everything in sight” that I’m used to. Isabel immediately makes an impact in the game, despite being an A.I., it’s clear that she has much stronger feelings than most of the human characters in the game. Isabel initially fears Atriox, which can be easy to dismiss as she’s an A.I., but when viewed as the fact that when even a computer is scared of a being, that being is not to be messed with. Captain Cutter quickly develops a relationship with Isabel, vowing to never back down against Atriox, and to use all the power he can muster to put a stop to him and his Brutes and to exact vengeance for Isabel’s previous comrades. There are other modes that can be approached when the campaign is over too (or earlier if you feel!). 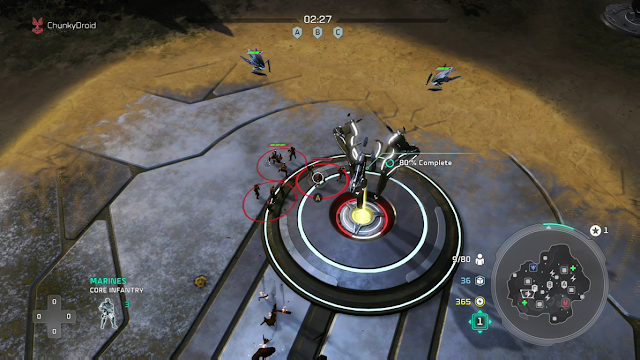 There is the Blitz mode, which incorporates deck-building with the standard Halo Wars 2 gameplay. It’s not my cup of tea; nothing that requires me to build a deck of cards ever, ever will be. In saying that, this mode does play well and those that enjoy deck-building games will enjoy Blitz mode immensely. Completing things like missions and tutorials earn cards to use in Blitz mode, so there’s always the opportunity and encouragement to collect more cards and staying competitive in this mode. The rest is pretty much just standard RTS fare, with the key mode being skirmish matches, both against A.I. and online. The game looks rather nice as well, the art direction is exactly what you would expect out of the Halo series. Abandoned buildings look derelict and the overgrowth is apparent without human disruption. Fighting within buildings and ships feels somewhat like the units are actually fighting within those structures, rather than the maps being created simply for strategy, the maps serve their narrative purpose first and foremost. On top of this, the soundtrack is serviceable. The sweeping score adds to the tension of war. It might not reach the orchestral heights of the main series, but it does its job well. Halo Wars 2 managed to drag me in kicking and screaming, and left me coming out more intrigued about the Halo universe itself. I have never been an aficionado of the Haloverse, nor have I ever been interested in it before. Halo Wars 2 may just change that. The campaign tells a safe narrative that is made more impressive by the intimacy of the gameplay. The multiplayer Blitz mode may not be for everyone, but between it, and the rest of the multiplayer, there's enough there to keep people going for quite some time.